[Madison, Wisc…] The University of Wisconsin System may face harsh questioning from legislators following the release of a report by the Legislative Audit Bureau (LAB), which shows the university system’s reserves grew at a very fast pace over the past decade. Members of the Joint Committee on Finance (JFC) will be given that chance at the UW System’s budget briefing on Tuesday morning. Every state agency testifies in front of JFC at the beginning of the budget process to explain their requests. The UW System is expected to brief JFC at a hearing on Tuesday beginning at 9am. While it is expected that UW officials will fight back against a $150 million cut in each year of the budget, a review of LAB’s report and Legislative Fiscal Bureau (LFB) documents shows the UW System still maintains rather large Program Revenue (PR) balances. During the budget debate two years ago, members of the CPA Caucus discovered the UW System had a balance of more than $1 billion. That so-called “slush fund” was made up of PR balances. One year later, the UW System’s PR balance dropped only slightly from $1.27 billion to $1.19 billion. UW officials have claimed large portions of the balance are now earmarked for specific projects, so they claim it is technically not surplus. In the last 10 years, however, it has grown significantly. The UW System PR balance has increased from $268.2 million to $1.19 billion – more than four times the size it was in 2004-05. The UW slush fund has also grown at a much faster rate than the system’s budget. In 2004-05, the PR balance was the equivalent of 6.9 percent of the UW System’s overall budget of $3.88 billion. In 2013-14 the PR balance was equal to 19.8 percent of the system’s $6 billion budget. However, it grew even more when matched up to the UW System’s general program operations (GPO) budget. When compared to UW’s GPO budget, the PR balance grew from 16.3 percent in 2004-05 to 54.1 percent in 2013-14. Even with the sudden increase in PR balances – many of which were supposed to be spent down after the discovery of the slush fund in 2013 – UW officials continue to say the much of the funds are restricted. The report also points out some of the fund balance may be incorrectly categorized. In addition to sizable PR balances, the LAB audit and Fiscal Bureau papers revealed multiple areas where UW may be spending more money than it should. Every campus in the system currently can offer tuition assistance in the form of remission to students based on a variety of categories – needy and worthy based on merit; extraordinary circumstances; athletic scholarships; veterans; among others. The amount is capped each year. The cap totaled $53 million in 2013-14. 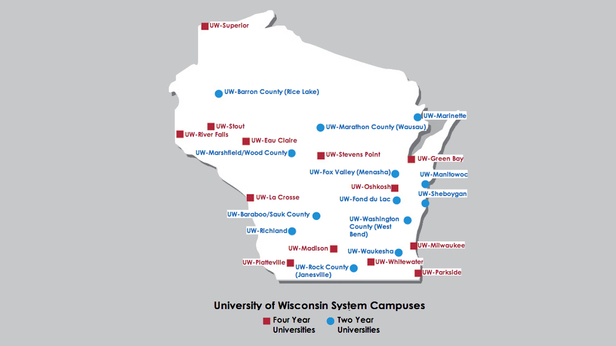 However, three campuses – Madison, Milwaukee and Whitewater – exceeded the cap by a total of $25 million. Nearly $21 million of that total was at UW-Madison. Faculty at UW-Madison are also paid more than the those at similar public institutions across the country. According to LFB, the average full-time, nine-month faculty member is paid $104,100 annually at UW-Madison. That is 13 percent higher than the national average for public institutions, which is $91,900. As the budget process continues, the MacIver Institute will continue to comb through agency budgets to find efficiencies and ensure every taxpayer dollar is being spent wisely. Check back often for updates and follow us on Twitter and Facebook for breaking news and instant analysis (links below). *Correction: An earlier version of this article claimed the PR balance increased since the discovery of excess UW funds, which is inaccurate. It did increase from 2011-12 to 2013-14 as stated in the original article, however the funds were discovered in 2012-13. The correction has been made in the above version.